You Might be Pregnant - What Next? Please click here to access our Self Referral Form. The thought of coming into hospital can be a little daunting. We naturally want to make your stay comfortable and are aware that many women would prefer the added comfort and privacy of a single amenity room during their stay. At Watford General Hospital we have two types of amenity rooms available for women to book. Amenity rooms are available for women who wish to have extra privacy after they have given birth. You will still be treated as an NHS patient, but are paying for the privacy of a single room. Please ask your midwife on admission regarding room availability. Payment by credit or debit card only please. Currently maternity inpatient services are provided on one site (Watford) with outpatient services provided on three sites (Watford, Hemel and St Albans). 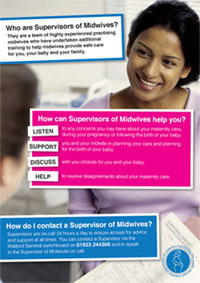 Maternity services are provided to women within the West Hertfordshire boundaries and as well as women from neighbouring areas who choose to book their care with the Trust. There are approximately 1100 deliveries per annum in the Alexandra Birthing Centre and this midwife led service has one of the highest water-birth rates in the United Kingdom. The Clinical Negligence Scheme for Trusts (CNST) has assessed our maternity service at level 2, which requires us to provide at least 60 hours of direct consultant labour ward cover per week. External cephalic version service for breech presentation.